Silvia Series There are 8 products. Women's short-sleeved coat, model Silvia buttoning with snap fasteners - Belt included Black Cherry striped Immediately available for delivery: sizes from XS to XL Made of Yarn-dyed Poplin, 65% Pol., 35% Cot. Small apron model Asceacontrasting bandBlack Cherry stripedone sizeMade of Yarn-dyed Poplin, 65% Pol., 35% Cot. Poncho-shaped apron, model SiriaV-neck and two side pockets Black Cherry stripedAdjustable one sizeMade of Yarn-dyed Poplin, 65% Pol., 35% Cot. Women's tunic, model Sara short-sleevedBlack Cherry stripedImmediately available for delivery: sizes from XS to XL Made of Yarn-dyed Poplin, 65% Pol., 35% Cot. Women's short-sleeved coat, model Silviabuttoning with snap fasteners - belt included Royal Blue stripedImmediately available for delivery: sizes from XS to XL Made of Yarn-dyed Poplin, 65% Pol., 35% Cot. Small apron model Asceacontrasting bandRoyal Blue stripedone sizeMade of Yarn-dyed Poplin, 65% Pol., 35% Cot. Poncho-shaped apron, model SiriaV-neck and two side pockets Royal Blue stripedAdjustable one sizeMade of Yarn-dyed Poplin, 65% Pol., 35% Cot. 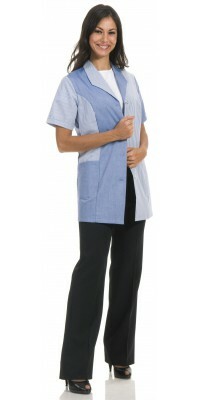 Women's tunic, model Sara short-sleevedRoyal Blue stripedImmediately available for delivery: sizes from XS to XL Made of Yarn-dyed Poplin, 65% Pol., 35% Cot.